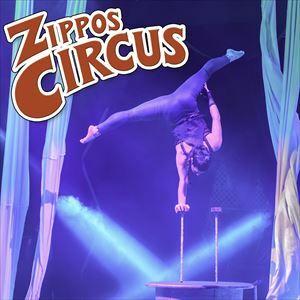 Zippos Circus is back with a nationwide Big Top tour - The Magnificent Top Hat - celebrating 21 years since Ringmaster Norman Barrett first appeared at Zippos Circus. Known to be the World's Greatest Ringmaster, Norman will present a spectacle like no other as astonishing acrobats and aerialists, amazing contortionists, clever comics and daredevil motorcyclists come together for this year's magnificent production. The thrilling Brazilian Lucius Team of five motorcyclists in the famous Globe of Death will take centre stage plus, returning by popular demand, is Paulo Dos Santos- a brilliant 3 foot 6 inches tall showman, acrobat and martial artist. They will be joined by a colourful troupe of artists from all around the world including foot jugglers, Kenyan tumblers, Cuban Springboard acrobats, knife throwers, contortionists and dancers. Duration approx. two hours including an interval of approx. 15 mins. We reserve the right to vary the content of the performance at any time. © 2016 Zippos Circus Ltd.